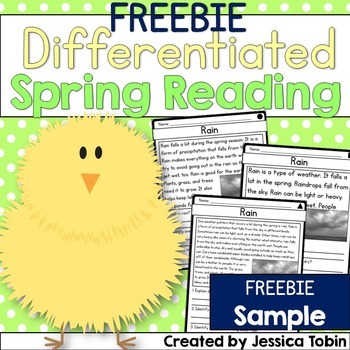 This sample is taken from my Spring Differentiated Reading Passages pack. I pulled the Rain topic from the pack to let you try for free. There is 1 nonfiction passage about rain and 1 fiction passage about rain. However, each passage comes with 3 differentiated levels. Each spring topic has nonfiction and fiction passages. There are three levels for each topic, too: beginning, growing, and advanced readers. Try it out! If you like it, here is the full unit! Need more 1st Grade Spring Activities? Need more 2nd grade level Spring Activities?